We found this was a fun way to learn a bit about geography, geology and science in a very hands on way! There are also minor plates too as the whole crust is made up of them. The plates float on the mantle and move as heat rises and falls inside the mantle. Nearly all volcanoes and earthquakes occur at these plates boundaries. Continental Plates - these make up the land masses that we live on. 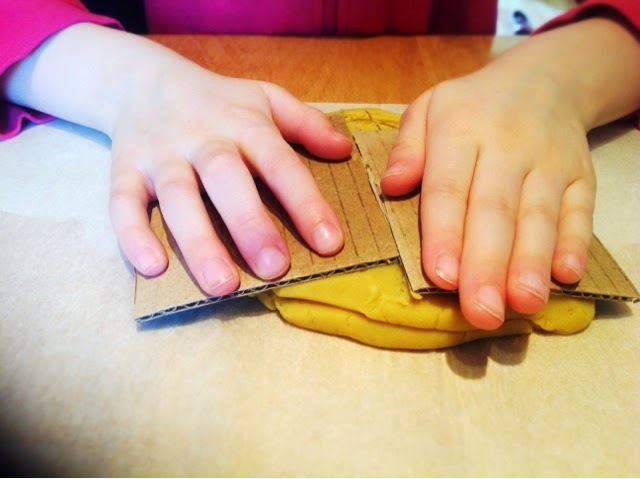 Play dough yellow, orange or red is our preferred colours but any colour will work! 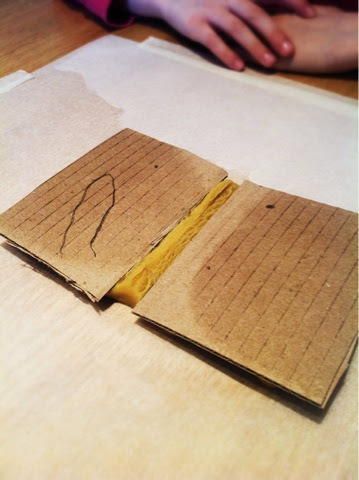 Some corrugated cardboard cut into rectangles not smaller than 7cm by 10cm. 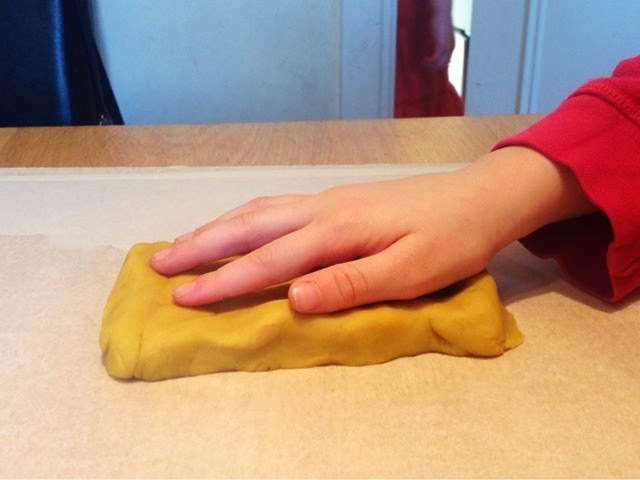 Knead your play dough until it is warm then place it on a flat surface in a flat shape about 2cm thick. 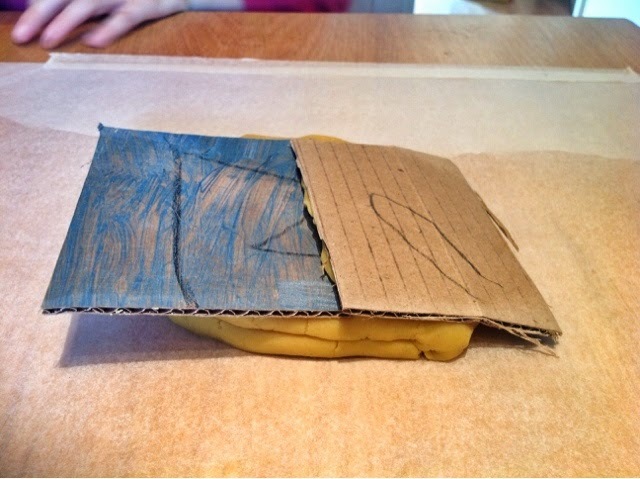 In this project the cardboard is the earths crust, each piece a different tectonic plate, and the play dough is the mantle. Place some pressure on top of the cards with your hands, pushing the tectonic plates slightly apart. You can see the play dough in between the crack we have made. When this happens to the tectonic plates the magma from the mantle is exposed and depending on where it is and how hot and how much gas is built up under the surface, a volcano may form. Underground volcanoes are created at these boundaries but are rarely fierce due to the pressure from the ocean. The reason why this is called a constructive plate boundary is because this type of plate boundary splits and allows magma to fill between the gap to make new ground. At these boundaries the plates move towards each other. It is when an oceanic plate moves towards a continental plate, because the oceanic plate is denser it slides underneath. This sort of movement causes earthquakes or volcanoes. and is known as a subduction zone! It can also cause tsunamis. To show how this would look repeat STEP ONE and TWO but this time, instead of pushing away, push towards each other with one tectonic plate (piece of card board) going under the other. TIP: remind the children that the plate underneath is the oceanic plate. The reason why this is called destructive is because, in as short as possible, the sea floor is eaten up, the sea water and sea life that is taken down with it go down to the mantle and turned into hydrogen and nitrogen. These gases mix with the hot pressurised magma in the mantle and lead to very large explosive eruptions! There is one more type of destructive boundary: collision, this is where the two tectonic plates have the same density and thickness and when the collide push up to make mountains! These create lots of earthquakes but no volcano. There is a third, as I said, it is called Conservative plate boundaries. These do not create volcanoes but do sometimes cause earthquakes. This sort of action very rarely causes earthquakes but when they do they are HUGE and very severe. If you want to learn more about these earth quakes, look up the San Andreas Fault, North America! 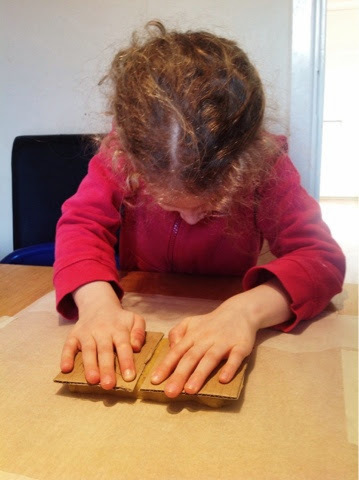 This is a simple idea but it helped by girls to understand what was going on without sighing at the sight of a book. I hope you found it useful too!